Almost one-in-five members of the House and Senate are a racial or ethnic minority, making the 114th Congress the most diverse in history. However, Congress remains disproportionately white when compared with the U.S. population, which has grown increasingly diverse in recent decades, according to a Pew Research Center analysis. 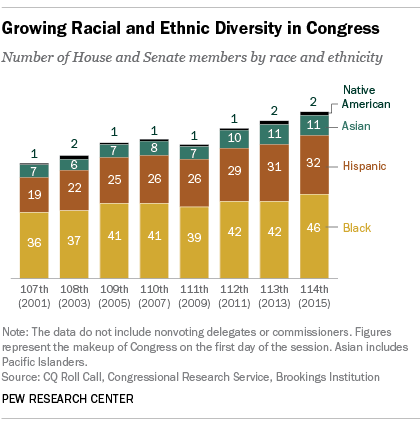 Diversity among congressional members has been growing for decades. But the nation’s population has diversified more quickly. When the 107th Congress took office in 2001, minorities accounted for 12% of Congress, compared with about 31% of the nation’s population. By comparison, in 1981, 6% of Congress was minority (black, Hispanic, Asian/Pacific Islander or Native American), while in the national population about 20% were non-white. Among minority groups, the biggest growth over this time has been among Hispanics. In 2001, there were 19 Hispanics in Congress, compared with 32 today. The increasing number of minorities in Congress is due almost entirely to membership changes in the House, where today 85 of 435 (20%) members are non-white, according to CQ Roll Call. In 2001, there were 60 minorities in the House. By comparison, in the Senate, just six of 100 senators now belong to a racial or ethnic minority group, up from three senators in 2001. The increase in the number of minorities in the House since 2001 has largely come among newly elected Democrats, though Republicans have also made some gains. Since 2001, the number of House Democrats who are minorities increased by 18, from 56 then to 74 now. By comparison, there was an increase of seven representatives among House Republicans over the same period, rising from four then to 11 now. But despite these non-white gains, whites account for 83% of the new Congress but just 62% of the population. This gap has widened over time. 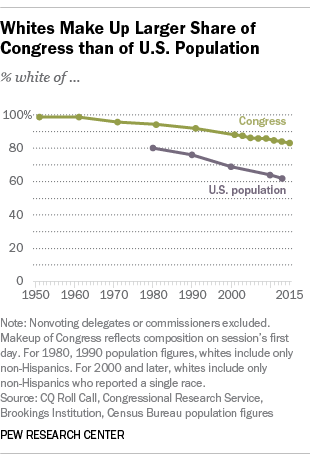 In 1981, 94% of Congress was white compared with about 80% of the U.S. population. Another way to measure the racial and ethnic diversity of Congress is to see what share of the U.S. population is represented by House members of the same racial or ethnic group. For the current Congress, 35% of the nation’s black population is represented by a congressional representative who is black, the highest of any minority group. By comparison, 22% of Hispanics, 12% of Asians and 8% of Native Americans are represented by someone of the same racial or ethnic group.